Let’s face it, not all women are born with the body and when some are, they can only take care of it given the right support financially and physically. It is so hard to be like those super models, but then again – should that hinder in showing off your style? 1. A-line skirts are ideal for women with wide hips. Why? Because they can disguise your hips are smaller than how it really is. You should make it a point to choose the one that widen towards the hemline and fall right below the knee. This is according to madamenoire.com’s article titled Fashion Wisdom for Wider Hips. 2. Wide belts and Sweater Dressing also give the same effect that A-line skirts do. Other than that they are suitable if you go to office, it’s probably cold there. This is also part of the Top ten things a girl should have in her wardrobe according to chicagomag.com. 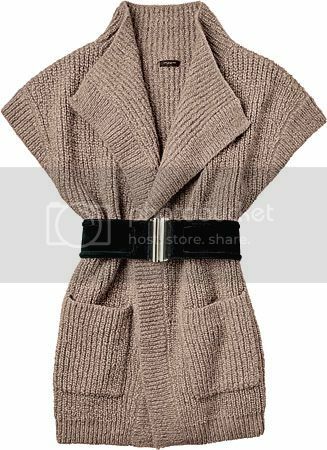 ANN TAYLOR sweater coat ($128) and wide belt ($48), at Ann Taylor, 600 N. Michigan Ave.
3. Wearing high-heel shoes or plumps can also help because for one, people who are tall make it really noticeable that they do have wide hips. This is a problem to those who are chubby and who aren’t really with height like super models, but somehow, wearing a good pair of plumps make up for it. Just like this pair of shoes as shown in coretherapy.com.au. Anyone can be at their best outfit at any day if they would only know the right combinations of clothes that suit them. So, don’t pout over your wide hips! Posted in Beauty, Daily Dose, Fashion, Girly stuff, Outfits, Shopping, Shops, Vintage and tagged fashion for wide hips, fashion ideas for ladies with wide hips, what to wear with my wide hips.